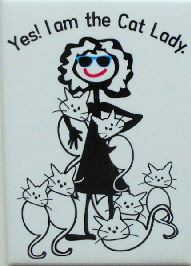 This magnet proudly says: Yes! I am the Cat Lady. This cat lady is surrounded by 7 cats. The magnet is 2 1/2" wide x 3 1/2" high. Previously owned but in good condition.